Do you have a sluggish thyroid? If so, you’re not alone. An estimated 13 million Americans suffer from thyroid disease, with more than half of those going undiagnosed. Because the thyroid is the “master of your metabolism”, having low thyroid function can lead to a wide range of unpleasant and unhealthy effects including fatigue, depression, weight gain, constipation, fluid retention, thinning hair and more. The good news is that there are natural ways to boost thyroid function and get your hormones in balance. But how does our thyroid become compromised in the first place? The Standard American Diet (SAD) is high in sugar and carbs and lacking in vital nutrients that are required to produce and activate thyroid hormones. 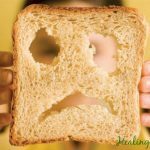 Our processed diet also contains two common allergens – soy and gluten – that can cause an autoimmune reaction that damages the thyroid. Endocrine-disrupting chemicals like those found in conventional produce, farm-raised or polluted fish, growth hormones, tap water, nonstick pans and plastics also damage the thyroid. FREE OF HORMONES, PESTICIDES & TOXINS: All recipes at Healing Gourmet are free from the thyroid endocrine-disrupting toxins found in our conventional food supply. This means NO BPA, PCBs, dioxins, rBST, PFCs, pesticides, antibiotics, artificial sweeteners, heavy metals, PFOA, chlorine, fluoride, harmful additives or preservatives. To learn more about how foods can help or harm the thyroid check out our Thyroid Diet section.